Labels: Jesse Eisenberg, Kristen Stewart, Misc. 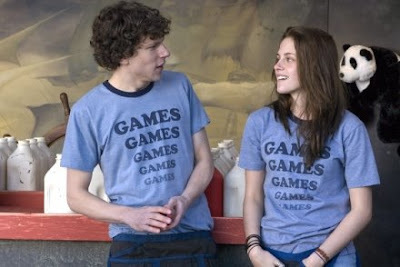 I finally saw Adventureland. I enjoyed the simplicity of it all: the setting, the characters, the storyline and all the '80s references. It featured a nice ensemble cast, I especially appreciated the scenes with Martin Starr and Kristen Wiig and contrary to popular opinion Kristen Stewart didn't annoy me with her acting, I'm starting to like her career even more. So what are your thoughts on the film? I looooove Kristen Wiig. I find her hilarious. I don't understand why people think she's one-dimensional. She definitely holds down SNL by herself. I really want to see this film. I didn't even know it was still out in theaters. I saw it at the $1 show so it still might be in regular theaters or it might be coming to DVD (or already on DVD). The movies that play there are usually in transition. And Kristen Wiig is the one bright spot on SNL. Her crazy McCain fan sketch still cracks me up! I hope she gets cast in more films.